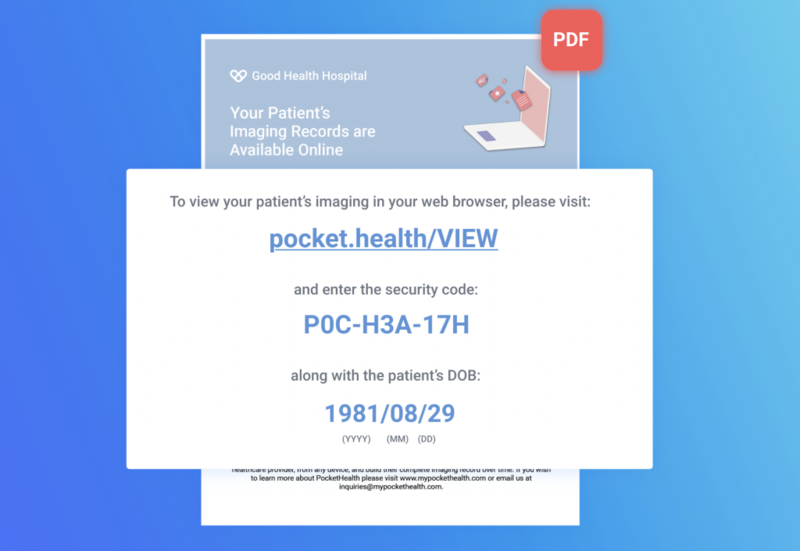 While PocketHealth offers patients electronic sharing tools to improve the flow of data to their care providers, on occasion physicians and healthcare facilities do not have an email address available that patients can share imaging records to. With this in mind, today PocketHealth announced a new way for patients to share imaging from their PocketHealth account: Print-a-Link. Using the Print-a-Link functionality (accessible from the share panel within every patient’s PocketHealth account) patients can now print a secure record access form (containing a link, unique code for access, and the patient’s DOB) to easily hand off diagnostic-quality image access to their physicians. Patients simply have to select which records they want to share and select the ‘print’ option, which instantly generates their record access form – active for 7 days from its creation. Patients can even take a photo of the form (or make a quick note) instead of printing — if they find it easier — and simply show it to their physician. From there, physicians only have to enter the URL, PIN, and the patient’s date of birth found on the form to have instant access to any records the patient has chosen to share, in their original DICOM format. Physicians, regardless of their familiarity of the platform, can view records from their web browser with eUnity – an FDA/Health Canada-certified diagnostic viewer – and can import them to their local RIS/PACS for future use. The entire process is streamlined, seamless, and instantaneous, making for a headache-free sharing process for both patients and physicians that further eliminates unnecessary CD burning that has slowed down the healthcare industry for years. Print-a-Link joins PocketHealth’s already comprehensive list of easy-to-use sharing tools that all patients can access from their account, including Email-based Sharing and burning their own physical media (CD/DVD/USB) from home.